Painting a ceiling is not as difficult as it may appear. Here are some tips to help you finish the job just like the pros. 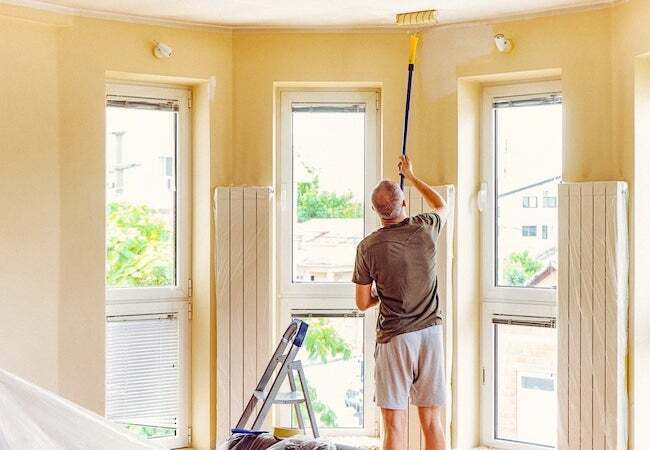 Painting is perhaps the easiest of DIY home upgrades, but tackling the ceiling can be a daunting endeavor, particularly since it requires a bit of elevation and contortion. Here are some pointers on prep and techniques for how to paint a ceiling that will help you accomplish the job easily and successfully, just like a pro. 1. Clear the room out, and cover the floor (and anything that remains) in cloths. Before you begin, remove as much of the furniture from the room as possible; doing this will make it easier for you to maneuver through the space where you’re working. Use drop cloths to cover any furniture that’s too cumbersome to move. 2. Mask tops of walls and crown molding with painter’s tape. 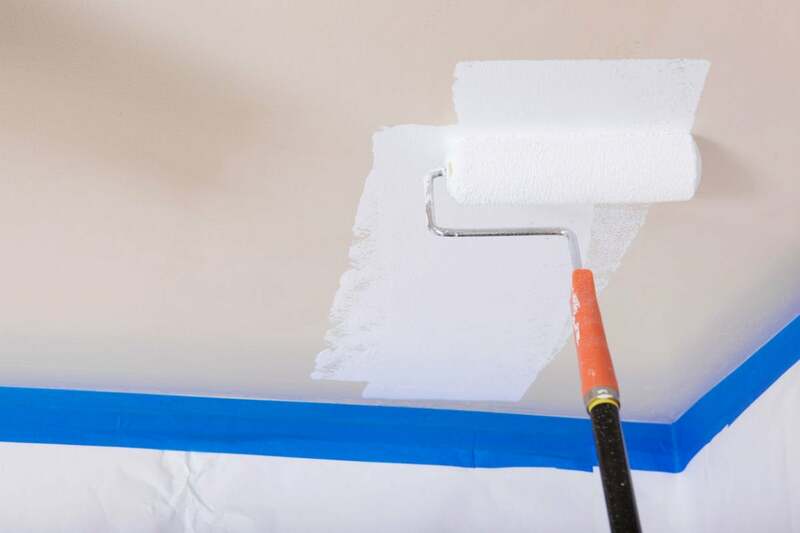 If you are just painting the ceiling and not the walls, use quick-release painter’s tape (see this guide for the best painter’s tape options) where the walls meet the ceiling. Painter’s tape should also be applied around any moldings that decorate the ceiling’s edges. If you plan to redo the whole room, the ceiling is where you should start! In doing so, taping off is less necessary—you can paint over any errant brush strokes when you get to the walls. 3. Prime before you paint the ceiling. Apply a coat of interior latex paint primer by roller (with an extension rod to reach the ceiling). Don’t cut corners and skip this step: The primer will provide a stain barrier and, in most cases, will make it possible to use only one coat of paint to finish. The specific primer you use depends on the texture of your ceiling. Smooth or lightly textured (e.g., knockdown texture) drywall ceiling would benefit from an interior latex drywall primer like Glidden Latex Drywall Interior Primer (available at Home Depot) that’s close in color to the paint. Ceilings with deeper texture (e.g., popcorn) require a high-build primer like KILZ High-Build Drywall Primer (available on Amazon). These products not only prime but also fill in grooves and imperfections in the ceiling. Allow the primer to completely dry according to the instructions on the can before you continue. 4. Cut in around the ceiling’s edges using an interior latex paint with high viscosity. Now, switch to paint, either one that is labeled as “ceiling paint” or an interior latex paint with high viscosity—measured in Krebs Units (KU), this is generally 106 KU or greater. You’ll find the KU measurement in the manufacturer’s specs for any given paint, if it’s not located on the back of the paint can itself. The slightly thicker paint sticks better to the ceiling and stays there until fully dry. Use a stepladder to paint a 2-inch to 3-inch cut-line along the edge of the ceiling. Start in a corner and with a 2-inch trim brush, paint about three feet along one wall, then the adjoining wall. While the cut-line is still wet, move onto the next step and begin painting the ceiling with a paint roller. Painting the ceiling while the cut-line is still wet will help reduce visible lines. The same will be true for paint applied from section to section with the roller. 5. Immediately load your roller with ceiling paint. To use a roller, fill the deep portion of a roller tray with paint and roll the apparatus over the paint until the nap is covered. (Depending on your ceiling’s texture, certain roller covers work better than others; get the scoop in our guide to the best paint rollers and make sure you choose the right one.) The key is not to submerge the roller, but rather to glide it over the paint, gently working it back and forth in the shallow part of the tray until the nap is completely covered and paint drips are minimal. 6. Attach the extension pole to the roller and to apply the first coat. To paint the ceiling, use the fully extended, paint-filled roller to create a zigzag pattern measuring 3 to 4 inches square. Next, go over the same area using straight, controlled strokes to even out the paint. Avoid leaving paint lines from the edge of the roller. Since you need to work while the paint is still wet, tackle smaller sections and be sure to feather the edges to reduce distinct, visible lines between sections. 7. Apply a second coat if needed. Wait for the first coat to thoroughly dry for the amount of time recommended on the can. Depending on paint and coverage, you may need to repeat the process—from cut-lines (Step #4) through painting (Step #6). Be sure to clean your paintbrushes, roller, and paint tray with warm soap and water. A paintbrush comb and a painter’s tool with a notch for cleaning rollers should help pull and squeeze out any last paint. Then, rinse only with water until you’ve removed any lingering soap. Shake, blot, and squeeze out any excess water. Or, consider speed-drying with a brush and roller spinner!